Why does a beautiful, talented woman take her own life? That's the mystery behind Richard Engling's Visions of Anna, a novel that takes us to the Paris of poets and writers, on and off a movie set in Hollywood, and to an epic ritual in the desert of Utah. 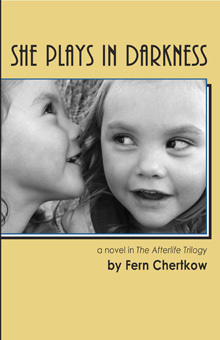 She Plays in Darkness takes us deeper into the mystery with a novel by Fern Chertkow, the author who inspired the character of Anna. Anna in the Afterlife takes us into another world altogether. Polarity Ensemble Theatre introduces a whole new way to experience theater with The Afterlife Trilogy: two novels to be read in conjunction with seeing a play. The Afterlife Trilogy combines two novels – Visions of Anna by Engling and She Plays in Darkness by Chertkow with a world premiere play written by Engling, Anna in the Afterlife. The three works span 35 years of creation, crossing the borders of the living and the dead, working in both the literary and performance modes. By the time it is complete, 40 to 50 Chicago area artists will have participated in developing, performing, publishing and presenting the works. Engling and Chertkow became close friends in graduate school studying fiction writing. The two spent a year in Europe after graduate school and experienced a particularly magical time living as novelists in Paris. Deeply affected by Chertkow's suicide, Engling used his friend as inspiration to pen his novel Visions of Anna and his play Anna in the Afterlife, both touching on friendship, death and self-destruction. Learn more about the works. Purchase both VISIONS OF ANNA and SHE PLAYS IN DARKNESS from Polarity Ensemble Theatre Books. $29.90 plus $5.00 shipping. 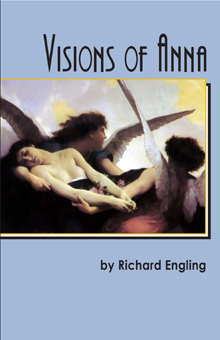 Purchase VISIONS OF ANNA by Richard Engling from Polarity Ensemble Theatre Books. $14.95 plus $5.00 shipping. Purchase SHE PLAYS IN DARKNESS by Fern Chertkow from Polarity Ensemble Theatre Books. $14.95 plus $5.00 shipping. American Theatre magazine covers the Afterlife Trilogy. Community Forum interview with Richard Engling on CAN-TV. Three Sides to the Story with Author Richard Engling. A podcast radio interview on the Amy Beth Arkawy Show. Theatre Geeks radio podcast interview. The Northern Star. An interview in the Northern Illinois University newspaper. Second & Church. "Novelist, Playwright Pays Tribute to Late Author"
The Evanston Review. "Friend's suicide inspires 'Afterlife Trilogy'"
The Examiner. "A brand new theatrical media mixture"
Daily Northwestern. "Evanston native honors late friend in novel, play"
Showbiz Chicago. "POLARITY ENSEMBLE THEATRE LAUNCHES TWO NOVELS OF THE AFTERLIFE TRILOGY"
Broadway World. "Richard Engling to Premiere THE AFTERLIFE TRILOGY"
Evanston Patch. "Evanston playwright paying tribute to fellow author with emotional project"
Chicago Tribune. 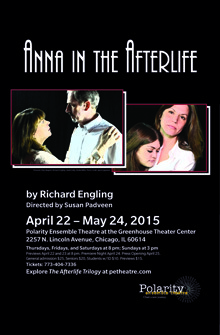 "Free theater event in Evanston to celebrate The Afterlife Trilogy"
Chicago on the Cheap. "Free theatre events: The Afterlife Trilogy"